Are you looking for something unique which expresses your intentions? 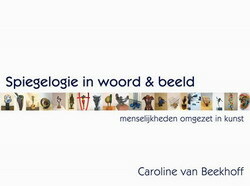 Apart from creating artworks out of her own inner drive, Caroline van Beekhoff also transforms your feelings, words and thoughts into a work of art. She is diverse in the use of materials, shapes and colours. Be it a fragile bronze, abstract plaster or a ‘caressable’ epoxy, Caroline’s style is varied and tangible. Are you interested in a very personal artwork? You can contact Caroline directly for an introductory talk or to discuss what your artwork should convey. Who knows you’ll be the owner of her next creation.